I think Donald Trump is lying. 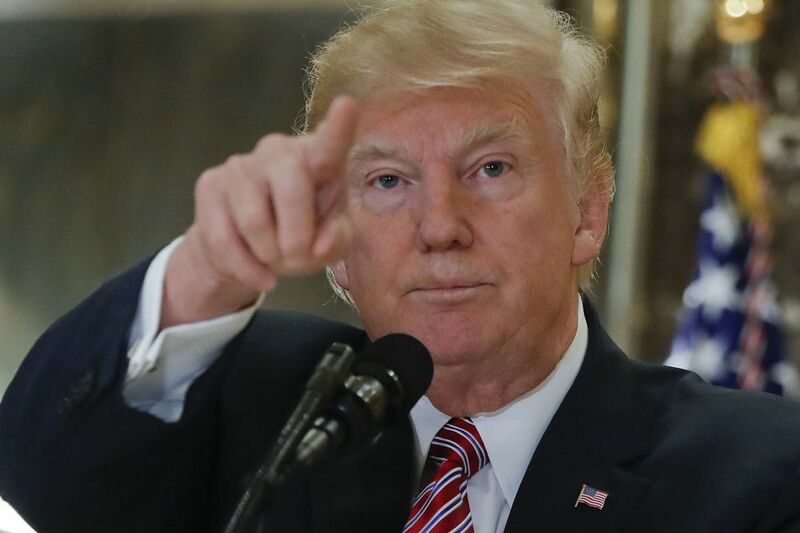 When he says, "Racism is evil and those who cause violence in its name are criminals and thugs, including the KKK, neo-Nazis, white supremacists and other hate groups that are repugnant to everything we hold dear as Americans," the words stand in stark contrast to the president's actions. Donald Trump's campaign, his presidency, and his business career have been marked by stark examples of racism. From a Justice Department lawsuit that accused Trump and his father of housing discrimination, to a years-long smear campaign to try to delegitimize the nation's first black president, to bringing the so-called alt-right into the White House in the person of Steve Bannon, Trump has repeatedly shown that he is comfortable with racism as long as it meets his ends. That's why Trump's repudiation of racism rang false, even in the wake of the horrific violence that left three dead in Charlottesville, Va., this weekend. Like all of us, the president saw hundreds of torch-bearing white supremacists descend on a tiny college town to protest the removal of Confederate symbols from a college campus. He saw anti-racism protester Heather Heyer lose her life. He saw the tepid response of police. But unlike the rest of us, Trump saw one thing more. He saw his supporters. And when he was forced to confront that awful truth, I believe he lied. Trump's decision to denounce racism is not the first untruth he's told during his unlikely rise to the presidency. But it has the potential to be the most damaging, because those who voted for him on the basis of racism are among his most ardent supporters. They heard exactly what I did when Trump spoke of Making America Great Again, and based on that message, they acted. But don't take my word for it. Take David Duke's. The infamous ex-Klansman spoke from the sight of the protests by white supremacists in Charlottesville. "We are determined to take our country back," Duke said in a video posted to social media by Mykal McEldowney of the Indianapolis Star. "We are going to fulfill the promises of Donald Trump. That's what we believed in, that's why we voted for Donald Trump. Because he said he's going to take our country back. That's what we gotta do." Duke uttered those words because he believed, as I do, that Trump represents white supremacy. And why wouldn't he believe that? Trump's policies have aggressively attacked communities of color. Not only did Trump fight to ban people from majority Muslim countries in Africa and the Middle East from coming to America. Not only did he target Latinos through increased immigration enforcement. He has also attacked black and brown people who are citizens. Under Trump, the Justice Department has rapidly devolved into the Injustice Department. It has been especially hurtful to people of color. On police brutality, the Justice Department has put a hold on consent decrees that would have forced 14 police departments to change abusive policies and practices that the Obama administration found to be discriminatory. On education, a Trump executive order seemingly threatened to remove $20 million in funding from Historically Black Colleges and Universities. After an outcry from the black community, he said the whole thing was a misunderstanding. But black college education is still under attack under Trump. The administration is preparing to use the Justice Department's civil rights division to examine the possibility of suing universities over affirmative action admissions policies deemed to discriminate against white applicants, according to The New York Times. We'll see if that happens, especially since Trump's proposed budget cuts funding from the Justice Department's Civil Rights division, which typically fights discrimination against minorities. That's not all, though. Trump also is looking to attack black and brown businesses by cutting funding from the Minority Business Development Agency, which assists minority-owned businesses "with the capital, contracts, and markets they need to grow," according to its website. These proposals, along with the Justice Department's attacks on voting rights through its support of a Texas Voter ID law that was previously found to be discriminatory, are certainly troubling. But Trump's decision to bring the so-called alt right into the White House is even more disturbing. So long as White House Chief Strategist Steve Bannon remains a part of the Trump administration, Trump's claims against racism will ring untrue. It was Bannon who told the world he provided a platform for the so-called alt right when Bannon chaired the right wing media organization Breitbart. It is Bannon who is viewed by white nationalists as one of their own. And since coming to the White House, Bannon provides racists a platform and a presence at the right hand of our president. If that doesn't change, I will never believe that Trump's repudiation of racism is genuine.